Japanese Episode AG 160: "Who is the Victor!? Pokemon Orienteering!" American Episode 430: "Off the Unbeaten Path"
On the way to the Battle Palace, Satoshi and his friends stop off at Potpourri Island. There, they overhear some trainers talking about a Pokemon Orienteering competition. The Joi at the Pokemon Center explains that the competition pits teams of trainers and their pokemon against one another as they travel throughout the island to obtain five stamps. The first person to return to the Pokemon Center with all five stamps receives a trophy and a huge amount of fruit! Satoshi-tachi and Musashi-tachi decide to compete, so everyone splits up and goes their separate ways. Musashi and Nyasu get tired of searching and decide to sabotage the other competitors, so they set a number of traps throughout the playing field. After slowing down Haruka and Masato, Musashi realizes that the Pokemon Center has been left unguarded, so she and Nyasu head there in order to steal the fruit and all the pokemon there! Satoshi's Ohsubame sees the Rocket-Dan and finds its trainer to alert him of their thievery. Before long, Satoshi-tachi catch up with Musashi and Nyasu and send them blasting off again. At the end of the day, Kojirou and Manene end up winning the competition! Kojirou keeps the medal but decides to donate the fruit to all other competitors, a gesture that infuriates his fellow Rocket-Dan agents. As Haruka enjoys a piece of fruit, she is approached by the Pokemon Center's Joi and is told about the Modama Town Pokemon Contest! Determined to win a third ribbon, Haruka starts thinking about her upcoming Pokemon Contest. The Battle Frontier has some really bad fillers. Luckily, this isn't one of them. The whole Pokemon Orienteering thing was interesting, and it's nice to see Kojirou actually win for once. I guess this would be the Battle Frontier equivalent of "That's Just Swellow," which was a pretty good episode itself, but the fact that everyone participated (even Masato!) made this one stand out a little more. Jimmy Zoppi was really, really off in this episode. His Meowth was just flat-out terrible, and his James voice didn't have enough emotion to it. I mean, when you're being out-emotioned by Sarah Natochenny, you know you've got problems. In the Japanese version, Azami is added to the shot of all the Frontier Brains during the opening animation. The Japanese version has two vocal songs, both of which were replaced by instrumental music for the dub. 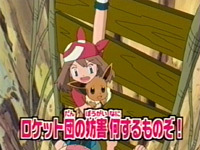 The first song was Pokémon Symphonic Medley and can be heard from the start of the Orienteering contest all the way up to the point where Haruka falls into the river. The second song is Maemuki Roketto Dan, which can be heard from the time Musashi and Nyasu decide to set traps until the point when Takeshi is caught in a net. PUSA makes the TO BE CONTINUED... screen three seconds longer in the dub. Bet you didn't see that one coming, did you?